The latest decades show a certain development in the interest given to collectible aircraft and more particularly to the mythical "warbrids" which wrote the glorious pages of the Second World War. This passion drove private buyers and companies to acquire legendary aircraft such as the Spitfire, Hurricane, Mustang, Warhawks and others, to present these historical treasures throughout numerous airshows in continental Europe, but even more so in England. All of this to the greatest pleasure of the spectators or passionate amateurs. But it is not possible to make those marvels fly again without a very particular technical attention under the approval of the aeronautical authorities. There are various specialized companies to restore and make them fly, and the Aircraft Restoration Company (ARCo) is one of them. It is certainly the most renowned and popular company within the historical aviation community to this day. The Aircraft Restoration Company is located on the legendary airbase of Duxford, Cambridgeshire and has dedicated itself since 1990 to the restoration, service and rendering compliant all these beauties from the past. ARCo was created by John Romain, former engineer at British Aerospace who, through his passion, also became a test- and demonstration pilot. At the start of this adventure, the team was only made up by a handful of mechanics from various horizons but with the evolution and expansion of its activities, ARCo now has no less than 68 people on charge, including the technicians and administrative employees necessary to run this evolving company. Due to their obtained Civil Aviation Authority (CAA) certificates (CAA approvals in M3, M5, B1 and E4), ARCo became recognized worldwide over the years. Thanks to this high class know-how, the company already achieved some great restorations for various private owners or museums, airworthy ones as well as static. Their continuous expansion and development allowed ARCo to receive the quality award "BS EN ISO 9001:2008 systems certification" in 2008, further enhancing the company's already high standards and reputation. Vouching on this reputation, ARCo signed a contract with the Ministry of Defense to ensure the major maintenances of the DC-3 Dakota and the Avro Lancaster of the Battle of Britain memorial Flight (BBMF). The hangars of ARCo also include Historic Flying Limited (HFL), under the lead of John Romain as well. This entity was created in 1990 to restore five Spitfires recovered from the RAF, which served as gate guardians at several airbases. In 2001 HFL left Audley End to integrate in Duxford airbase together with the Aircraft Restoration Company. The clustering of these two companies allowed the Aircraft Restoration Company to become a major and eminent firm in the world of "Warbirds". Who is John Romain ? John's aviation career started upon leaving school, when he became a technician's apprentice at Hawker Siddeley Dynamics, later to become British Aerospace. Engineering came naturally to him and he was awarded Apprentice of the Year in his first year of duty. During his apprenticeship at Aerospace, John was qualified as a missile systems designer but also accomplished many other projects. One to note, being to design, build and drive a vehicle which could cover as many miles as possible on one gallon of fuel. In the competition, attended by major manufacturers, including those from the motor industry, John's vehicle came first giving 1,379 miles to the gallon! John left British Aerospace in 1980 and started full-time duty at Duxford taking over restoration of the first Bristol Blenheim. He was already working there as a volunteer since 1972. Thanks to this passion and involvement, John had already gained a lot of experience on vintage aircraft whilst working with the late Ormond Haydon Baillie. During the early 1980's John learned to fly, gaining his private pilot license in 1984. Eager to fly tailwheel aircraft he underwent training with John Larcombe, an ex-RAF instructor, who converted him onto the Chipmunk, Harvard and Beech 18. John obtained his commercial pilot's license in 1988, however, as a fully licensed engineer with considerable experience on vintage aircraft, he was in permanent demand to continue in engineering. Since setting up the Aircraft Restoration Company in 1989, John runs the company from its Duxford base. Following his crash at Denham in 1987, rebuilding the second Blenheim was the most publicized of the company's achievements, but a wide range of aircraft have also been through the workshops since. John's flying career continued to expand after further training with Hoof Proudfoot, Mark Hanna and John Crocker. He gained his aerobatic and formation skills and all the necessary to fly larger aircraft such as the Bristol Blenheim and North American B-25 Mitchell. In the last ten years, John has flown over 88 different types of aircraft including the Royal Aircraft Factory SE5a, Westland Lysander, Supermarine Spitfire, Hawker Hurricane and Chance Vought Corsair. His latest type conversion was the Hispano HA-1112-M1L Buchon in September 2006. John is also chief test-pilot for Historic Flying Limited and carries out air tests on each finished project, successful completion which will earn the aircraft its Permit to Fly from the Civil Aviation Authority. John logged no less than 500 hours on Spitfires by July 2007, a noteworthy feat indeed. In 2007 John was also awarded with the Breitling Trophy for the Best Solo Display, which he flew in a Spitfire Mk IX. 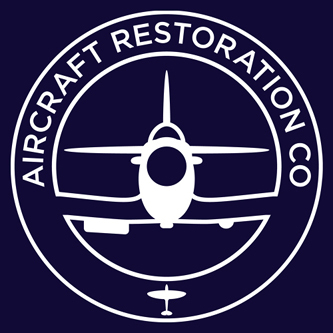 What does the Aircraft Restoration Company offer? The core business of ARCo is, of course, the engineering, covering all the technical aspects of the restoration, as well as the maintenance level, and ensuring follow-up of the project from the initial phase until completion. In doing so, they provide their clients the transition from "dream to reality". All the experts apply their knowledge and specialized skills in order to carry out the projects. The passion and extraordinary know-how of the team-members ensures to their clients that their jewels will be treated with the highest regards. The great diversity in knowledge on the matter also ensures that nothing will slow down nor compromise the project and this is, in a certain way, the motto of the company. The Aircraft Restoration Company offers a transportation service as well. It is not always easy to transport a valuable aircraft and that is why ARCo developed this parallel activity allowing aircraft to be transferred to any location, be it by road or by air. ARCo certifies it can put everything in order, from the necessary transport documents to the export licenses. This specificity of ARCo made it possible to containerize various types of aircraft and ship them to the United States, New Zealand and European countries of course. Spitfire Mk IX T PV202 during heavy maintenance This is the "House Spitfire"
ARCo distinguishes itself not only within the airshow community but also in the film industry by proposing its aircraft, pilots and technical advises for the reenactment in movies and television series. Some of their achievements on that matter : Dark Blue World, Guys Martin's Spitfire, The One Show, Memphis Belle (Movie), Top Gear, Valkyrie (Movie), Ewing McGregor's: "The Battle of Britain" and "Bomber Boys", Dunkirk (Movie). Bristol Blenheim MKI, Supermarine Spitfire T.9, Hispano HA-1112-M1L Buchon C.4K31, North American T-6 Harvard IV and De Havilland Canada DHC-2 Beaver. Other projects to expand the fleet are equally underway: a Westland Lysander and a superb Fairey Firefly Mk TT.1. SBAP would like to thank John Romain, Anna McDowell and the whole ARCo team for their heartily welcome during our visit and a particular wink to Colin, our guide of the day, for his explanations and the sharing of is crafts-passion.